The 62nd Primetime Emmy Awards, hosted by Jimmy Fallon, will take place this Sunday, August 29, at NOKIA Theatre L.A. LIVE in downtown Los Angeles, states entertainment reporter Bruce Edwin, and will air exclusively on NBC. For the first time in more than 30 years the show will air live coast-to-coast (5-8 p.m. PT, 8-11 p.m. ET). The mission of the Academy of Television Arts & Sciences Foundation is to shape the future of television while preserving its past. The Academy of Television Arts and Sciences are dedicated to educating, guiding and providing access for the next generation of the television industry. The Foundation employs the resources of the Television Academy and the artistry of television to preserve and celebrate the history of the medium and connect the next generation with television’s legends. It is the goal of the Foundation to reach out to a diverse audience through its nationally recognized, unparalleled programs and ensure that television will reflect the voices, stories and concerns of a multicultural, complex society. 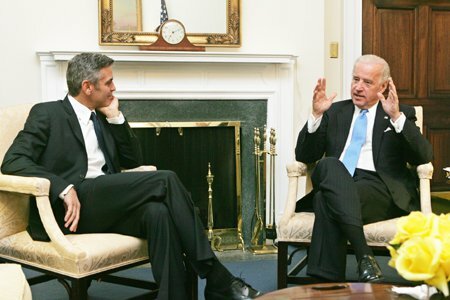 Writer, director, actor, and producer George Clooney, renowned for his humanitarian efforts, will receive the Emmy’s Bob Hope Humanitarian Award this Sunday, reports Bruce Edwin, and is only the fourth person to ever receive this esteemed recognition. Fans can see George Clooney honored live, August 29, on the 62nd Primetime Emmys. Story and image, (c) 1995-2010 Academy of Television Arts & Sciences. All rights reserved. Emmy and the Emmy statuette are the trademark property of ATAS/NATAS. Also (c) 2010, The Hollywood Sentinel, Bruce Edwin.